Outdoor AC Unit Problems | MarGo Plumbing Heating Cooling Inc. When Is It Appropriate to Replace an Air Conditioner? For a central air conditioning system, it’s standard that one unit remains outdoors, and the other one remains indoors. The outdoor unit is crucial for dispelling the warm air absorbed by the indoor unit. Yet, the outdoor unit is the one that’s forced to withstand all the elements. The outdoor unit has to endure extreme weather, dirt, animals, and more. Meanwhile, the indoor AC unit is nice and cozy inside the home. It’s not fair, but that’s just the way it is. At the very least, we can warn you about some of the potential problems that an outdoor AC unit can encounter. Nothing’s more natural than dirt in the outdoors, but for your outdoor AC unit, gradual dust and dirt buildup will contribute to several problems. The AC contains several finely-tuned and positioned components, and a little bit of dust every day can disrupt their functions. For example, the outdoor AC contains the condenser coil, a set of copper tubes designed to dissipate warm air. However, with a layer of dust over the coil, it can act as an insulator and prevent that heat from leaving the coil. 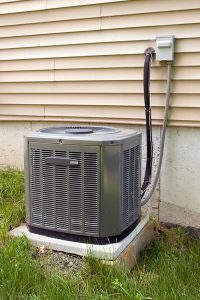 The condenser coil is just one major part that the AC relies on to generate cool air for the inside of the home, so excess dust and dirt can cause the unit to overheat and shut off. Likewise, the fan that helps with this process can also become covered in dirt. With too much dirt, the fan can become imbalanced and lead to the motor burning out. At that point, you’ll need to call an air conditioning repair service in Wayne, NJ. Hot and cold weather can cause your AC to work differently. At the ideal temperature, the compressor will work at a reasonable level to cool the home. If the weather makes the outdoor temperature too low, it will force the heat exchanger to compensate for the compressor. On the other hand, an outdoor temperature that’s too high will force the compressor to work harder than usual. Modern air conditioners are built with these factors in mind, however, so regular maintenance will be enough in protecting against these temperatures. Likewise, their internal components are safe from rainfall. Rats, mice, squirrels, raccoons, pets, and other animals can cause damage to your outdoor AC unit. And we know because it happened to us once! One time in the summer, a customer called because their AC stopped working. We checked the indoor unit, and everything was fine. Outside, we saw that the outdoor unit had stopped working. We were expecting nothing more than an electrical issue. But when we opened the cover, we found a family of snakes! They’d made the outdoor AC into their home. Sadly, a snake that was wrapped around the fan didn’t survive—and there was the cause of our broken AC. Curious animals can damage various components of the outdoor unit. One way to protect against them is with a condenser cover. These covers are specifically designed to cover the unit without restricting air flow. If your outdoor unit is having problems, don’t delay. Contact MarGo Plumbing Heating Cooling Inc. today.